On Somnambulist, The Kandinsky Effect wields its musical power in a welcoming way. Their 3rd album (and 2nd for Cuneiform Records) isn’t form-eschewing free jazz, nor are the tonalities the trio employs particularly “out.” The real revelation – and revolution – comes simply in the way saxophonist Warren Walker, bassist Gael Petrina, and drummer Caleb Dolister organize sound. The Paris-and-New York-based trio is a purist’s nightmare — and not only that of a jazz purist either. Since their first, self-titled album came out in 2010, The Kandinsky Effect has been boldly blending jazz with elements of everything from hip-hop to electronic music, making for an idiosyncratic amalgam that never goes exactly where you might expect it to. If you can envision a world in which a contemporary jazz giant like Joshua Redman jams with The Roots and electronic instigator Aphex Twin, then you have a head start on your ability to assimilate the sound of Somnambulist. But nothing can completely prepare you for its marriage of groove, atmosphere, and incendiary playing. The ability to incorporate a broad range of musical, geographical, and emotional influences into their music is at the core of The Kandinsky Effect’s makeup. Formed 2007 in Paris, France, the original lineup began performing as the Warren Walker Trio, and included Petrina and Parisian drummer Gautier Garrigue. 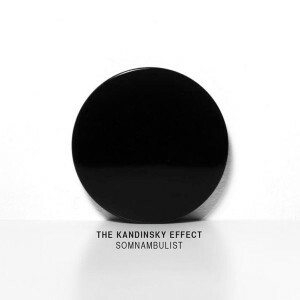 Not long after, they named themselves The Kandinsky Effect in homage to Russian painter Wassily Kandinsky, and recorded a self-named album, released in 2010 on SNP Records. While influenced by hip-hop and electronics, their debut album was much more rooted in jazz and featured mostly acoustic instrumentation. Dolister joined for The Kandinsky Effect’s Cuneiform debut, 2013’s Synesthesia, which began to expand the band’s sound, blending everything from Petrina’s fondness for electronica (IDM) to Dolister’s love of heavy rock bands like Meshuggah, and Walker’s unique approach to composition and electronic soundscapes. Over the years, the group has traveled extensively to perform with multiple trips and tours to Europe, Asia, and North America, perfecting what Dolister calls their “intellectual groove instrumental music.” And from the slip-sliding beats and slithering sax lines of opening track “Copalchi Distress Signal” to the insistent pulse and layered, lyrical melodies of closing cut “Muji,” there’s a feeling of the refinement process reaching fruition on Somnambulist. the kandinsky effect would like to sincerely thank everyone that helped us make this record; without your support this would not have been possible. we also want to especially thank merri & gary, samantha, maria, michaela, and joe for their generous contributions.